If you haven’t read part 1, check it out. After our sad goodbye to Caitlyn. Kevin and I headed out to explore the side of the strip we hadn’t gone to yet. Our goal was to slowly make our way to where our show for the night was. This show was weird, though I’ve a feeling all Cirque Du Soleil shows are. As we weren’t willing to spend $50 on the book that explained the show I am not fully sure of what the story was. However I will say that it was excellent. It began with a guy showing up behind us in a oversized suit and wild spiked white hair, he began talking to everyone down the stairs in the aisle seats. Every time he showed up a spotlight would follow him. He proceeded to “help” guests to the wrong seats, move people from their assigned seating to another person’s seat, and balance popcorn on people’s head. I think my favorite part was when he was dragged off stage and sent three buckets of popcorn across some rows. He was definitely one of my favorite parts of the show. However the best part of the show was when 6 people came down from the ceiling on swings and bungee cords. They pulled some amazing stunts up in the air and I would love to one day try something like that. 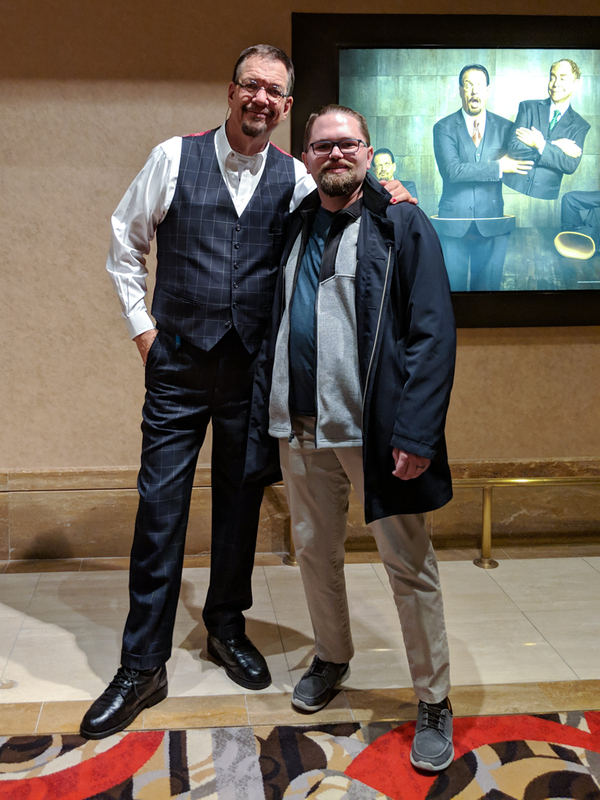 Technically Kevin and I have seen a Cirque Du Soleil show but it was a small bit, back in Calgary as part of an orchestra event we went to. This was our first full Cirque Du Soleil show and I am so glad we went. Started bright and early, 5:30am. We ate breakfast, packed a bag and headed to the hotel lobby to wait for a shuttle. The shuttle picked us up and it was off to the Grand Canyon. This was stop two and the main event for the day. Within this section we were given a map and our tour guide was extremely helpful in planning out what we were going to do. We had only three hours to see the canyon which isn’t a lot of time. Her recommendation once we arrived was super helpful. Upon arrival we change to the Reservation shuttles, our guide recommended that we skip the first stop as it was a ranch location that showed you cattle and horses but not the canyon. We followed her advice and skipped this stop. The second stop was the Sky Walk. We paid extra for the sky walk and at first I was frustrated, because you are not allowed to bring your cellphones or cameras onto the walkway. You also have to wear booties over your shoes and it just seemed like a full on tourist trap. It is a tourist trap, however a worthwhile one. Getting to see the canyon walls from the sky is amazing. Being above the flying birds was super neat and not something you get to experience often. Standing on glass looking towards the bottom of the canyon, thousands of feet below you is a weird experience. We both were fine when not moving, but it was a weird sensation to be moving and looking down through the glass. We decided to again pay extra and get a professional photographer. It’s a little pricey but I think totally worth it for the photos we got. We spent an hour on the sky walk and then headed to the last stop on the shuttle, deeper into the canyon. Again we followed our tour guides advice and got food the second the shuttle landed. I’ll talk about the food below but I am glad we got it first. We were hunger by then and it was better to explore more on a full stomach. By this point we only had an hour and a half left in our time and after quickly eating decided to follow the trail and explore. The biggest frustration with this is that all our hiking gear was at home and we were in our city shoes. Nor were we fully dressed for the cold breeze and Kevin was starting to hit full cold mode. So we didn’t travel as far as we would have liked. We snagged some pictures and ended up finding a comfy rock to sit on and enjoy the view. Eventually we headed back to the shuttle and hopped into our bus to head back home. Like the aquarium mentioned in part 1, all of what we saw was built for tourism and not about education. I do wish there had been more educational information. I would have loved to have learned more about the Native Reservation on the Grand Canyon and their relationship with tourism. I would have also loved more information on the dam and how it’s effect the ecosystem that was there before it was built. These are all things I can google and with time I hope to learn more. Overall this tour was fantastic and I am so glad we took the chance to see it. Kevin in full cold mode was tired so we spent most of the day in the hotel room. Not the best way to spend our last day however we did have plans that night. This was our last thing before leaving and it was quite the show to go out on. 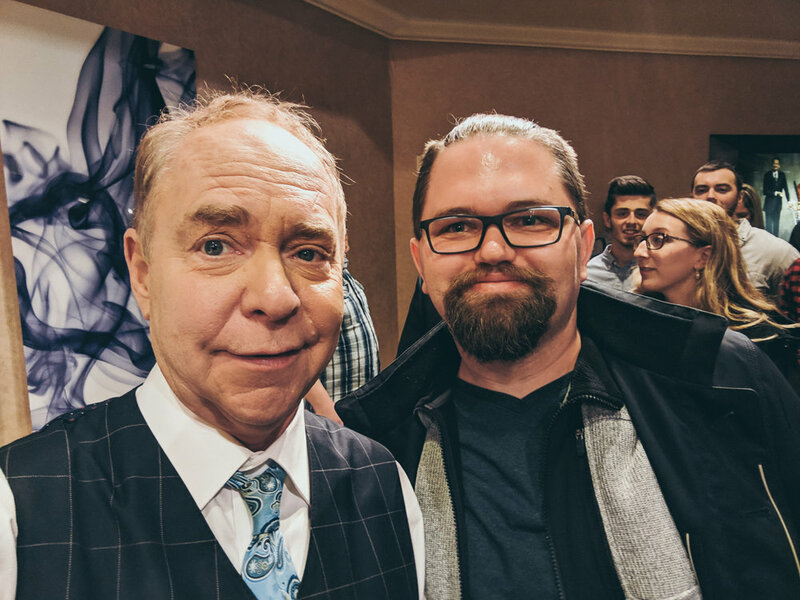 Having never been to a professional magician show and having only seen minor things that Penn & Teller have done, I wasn’t sure what to expect. But this was an excellent show. Our seats were on the mezzanine, which I was thankful for because they called up over 50 people to be on the stage during the performance! We arrived about 50 minutes early, took our seats and had a chance to listen to some Jazz while we waited for the show to start. The music was two people, one on a piano and the other on the bass. The person on the bass was not who we expected and it was quite a nice surprise. Like the Mystere show mentioned above, the show started before it actually started. So if you get a chance to go, go early. Our last day in Sin City. We woke up, ate breakfast, and packed. Eventually headed to the airport. We did not explore much of Vegas on this day, because to be honest we were kinda done with the city. A part of me understands that Vegas is very much a night life city, but it also made me wish we could have gone to matinee shows. We could have packed for more into our stay if we had found any, that said I am not sure the cost would have made that something we wanted to do. As we aren’t big drinkers or party people, shows are the only attraction in the city to go unless you are here for shopping. Overall we spent just short of three grand on activities, hotel, and the flight down. As well as a grand on food. That’s a lot of money for 7 days. Seeing my bestie was the best thing and also something I needed but the expensive was definitely not. I am glad to have experience Vegas as an adult and now can happily cross off Nevada and Arizona from my travel list. Mostly likely we won’t be back. Have you ever been to any of the shows I mentioned here? Would you go on a helicopter ride? What’s your thoughts on Vegas?